The castle is constructed on the site of an earlier fortress said to have been originally built in 1716 B.C. by the soldiers of Hercules. Slightly more plausible is another legend recounting that the name “Oropesa” is from “peso de oro” (peso of gold)—the ransom for a Christian princess. Whatever structure existed on the site in those early centuries was destroyed during the Christian reconquest. The present square layout of the castle and massive town walls survive from 1366, when Don García de Toledo took command of the castle. In 1402 he added the palace and plaza. A century later Oropesa became one of the main bases of rebellion against King Carlos V during the comunero revolt, one of the largest uprisings in Spanish history. Juan Padilla, leader of the revolt, was supported by Don García Alvarez de Toledo, count of Oropesa, and used the castle for his soldiers. The rebellion was finally put down, Padilla was executed, and the count, threatened with the destruction of his property, swore allegiance to Carlos V.
One count of Oropesa, Francisco de Toledo, was viceroy of Peru from 1569 to 1581. He was renowned for his liberal laws favoring the Peruvian Indians and for the establishment of the famous University of San Marcos in Lima, Peru. The region around Oropesa is known for its handicrafts. The neighboring village of Lagartera is famous for its centuries-old tradition of embroidery work, and to the east in Talavera de la Reina, azulejos colored in blue and yellow designs are manufactured. For a splurge, try the suite (room #204) in the tower with views over the plains and the castle and enjoy the gorgeous, hand-painted canopy bed. Oropesa is 117 km west of Toledo off the National Road V. The 4-lane highway is good, but traveling through Talavera de la Reina is slow. Oropesa has train service. 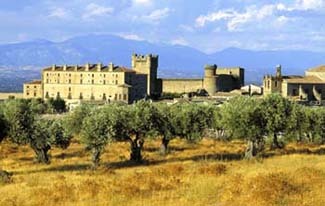 Sitting in the foothills of the Sierra de Gredos, this majestic castle is one of the oldest paradors in Spain. It commands an extensive view encompassing snowcapped peaks, olive trees, and the whitewashed village of Oropesa. Driving through the massive stone archway to the castle entrance, you’re surrounded by ancient walls and towers. Inside, you're immersed in more medieval ambience, with tile floors, high ceilings supported by wood beams, stone chimneys, and old chests. Spacious guest rooms are appointed with thick throw rugs, contemporary furniture, folk art, and enormous tiled bathrooms. All rooms are air-conditioned—a welcome relief if you're here during the summer months. Sunset is the best time to sit out and enjoy the view of the valley and the distant Sierra de Gredos Mountains. The dining room is painted white and accented with dark-beamed ceilings. The excellent cuisine features roast kid, traditional lamb dishes, and stews based on the seasonal produce of the area. The castle's parade ground is used for theatrical, dance, and zarzuela performances during the summer months.